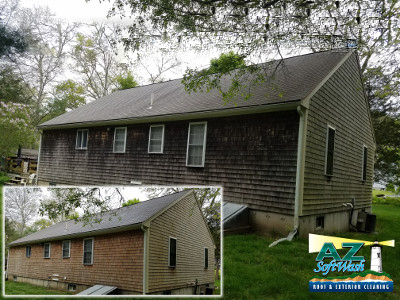 House washing in Cape Cod and Southern Ma. is the perfect way to improve the overall look of your home while creating a healthier environment. Our cleaning is always done without using a power washer, which ensures that damage is never caused! We are also the only company around that warranties our cleanings in writing. Exterior cleaning is a cost effective approach to maximizing the curb appeal of your home. Did you know that your property value increases right after you have had the exterior of your home professionally washed? It also makes the sale of a home much easier. What matters most is that you locate a reputable and reliable Cape Cod area pressure washing company to take care of the job for you. 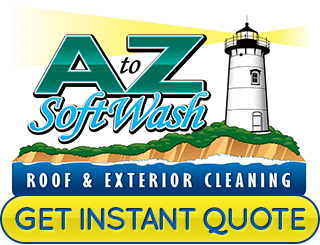 Locals know that, for the best in service and results, the name to trust in is A to Z Softwash. We go above and beyond when it comes to taking care of our customers. This is also not the type of exterior cleaning service that you should attempt to take care of on your own. Too many homeowners think they can rent a pressure washer and get their home clean. Yet the inferior rental versions, when used by a novice, is not going to get you the level of clean that you want. Too much pressure will be used and the high areas will be tough to properly clean. Remove unsightly marks, stains and discolorations like tannin from siding, trim, driveways, and more. Leaves, sticks, rubber marks from tires and those spots where a driveway game of basketball ends up scuffing up the side of the house can all be a thing of the past. Help rid your home of harmful contaminants that tend to cling to the surfaces. Mold, mildew and other substances not only look bad, they can eat away at materials like wood or shingles. Plus, having this on the exterior of your home means it will impact the health of the people on the interior of the house. Investing in house washing in Cape Cod also means that you can prolong the lifespan and enhance the performance of details of your home. From the siding to your deck, having the exterior cleaned up will offer improvements all around. For more details on the benefits of professional pressure cleaning for your home, give our team a call! We'll gladly walk you through our softwash and pressure washing methods for various types of surfaces you may want cleaned around your home. If you are finally going to get house washing services, why not make the quality count? 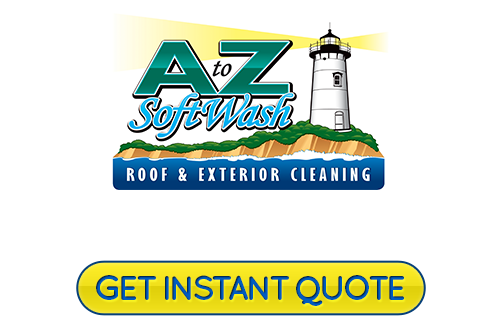 At A to Z Softwash we guarantee that you will be beyond satisfied with the outcome our Cape Cod roof cleaning and pressure washing experts provide. Let us help make your home look as good as new again, if not better. Call today so our house washers can get started right away. If you would like an estimate for house washing in Cape Cod, please call 508-209-7795 or complete our online request form.